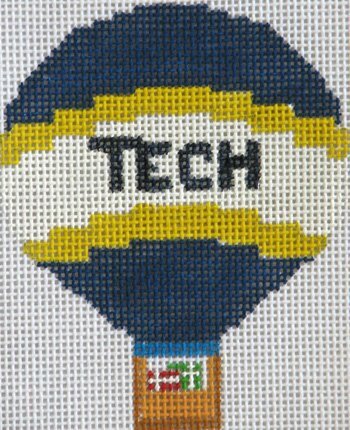 This balloon needlepoint canvas with your school colors is 3.5" x 2.75" on 18 mesh. You can purchase this needlepoint design canvas-only or with your choice of fibers - see the drop down menu for options and prices. The cotton is DMC floss; wool is Bella Lusso; Silk is Planet Earth Pepperpot. If you require stretcher bars we recommend a pair of 7" and a pair of 8" stretcher bars and some thumb tacks. The balloon can be painted in any color. Only letters of your school appear.